“The Conspirators” contains a second, albeit more esoteric, connection to Star Wars. Bernard Behrens provided the voice for Obi-Wan Kenobi in the Star Wars Radio Drama series that originally aired on NPR. Thought you’d explore a key repetitive line/theme throughout the entire episode “this far—and no farther.” It pretty much answers the question you all posed during the podcast. Why end this incarnation with this one? The metaphor of what was written on the Full’s Irish Dew whiskey bottle “let each man be paid in full” taps into the idea that Falk was making an ungodly amount at the time per eppy ($200K?) which was unsustainable expenditure and “this far” brings this series full circle—they’d tapped all ideas, all that was said needed to be said—“no farther” was needed as in more episodes. End it. Point of no return. Finished off. Til 1989. Yup, totally agree. Columbo’s ‘sky falling in’ I think was also a nod to how much he’d pushed and pushed the studio. He was on a helluva lot of money, even by todays standards. The last line of the series is by Columbo, isn’t it? The ‘this far…’ he says? In terms of run time, is this the longest Columbo? The box set makes a thing of this being a two hour episode. Hmm… Review two episodes per pod, and look at the satire, class warfare, and sticking it to the man, while being, eh, uniquely patriotic? I thought that the mystery and clues in this episode were really weak, but I really enjoyed everything else. 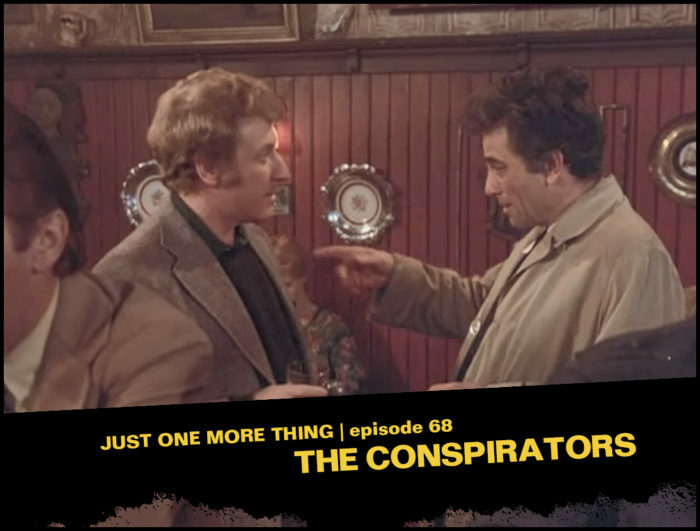 The interaction between Columbo and Joe Devlin is outstanding, and the comic relief bits are actually fairly comical. As for why Devlin goes back to find Columbo at the crime scene: from what I’m told, this is something that happens a lot in real investigations. Seasoned detectives know that if some bystander or interested party shows up repeatedly at the crime scene, tries to get chummy, and wants to “help out with the investigation,” that’s someone to investigate carefully. Murderers often think that they can nudge the detectives in the direction they want; even if they supposedly know better, sometimes they just can’t help themselves. They want to be in control of the situation. On the whole, I was pleasantly surprised by how much I liked “The Conspirators.” The original series could have ended in many worse ways. But then why would Devlin come back to the hotel room/murder site? Like RJ said, Devlin’s categorical screw-ups sort of betray his character’s supposed background of being criminal savvy and familiarity in interacting with the police. The fact that he’s a good writer and artist shouldn’t be confused with his criminal acumen—which is near zero. And Columbo usually takes the time to point out incompetent behavior to particularly incompetent murderers! I kept waiting for “ya know, sir, you’re one hell of a clever author and storyteller, but you’re just plain lousy at murderin’ a fella.” Maybe Columbo likes Devlin too much. Or maybe he figures it was the Dew (Full’s, not Mountain) talking.